The Soviet Manned Lunar Programs, from the American and Russian Perspective. The opinions and evaluations stated here in are only the author's and cannot be construed to reflect those of any Government agency, company, institute or association. It is based on public information, circumstantial evidence, informed speculation, declassified U.S. intelligence community documents, official Russian documents and histories, oral histories, interviews and engineering analysis. As with all data regarding the former Soviet space programs, this analysis is subject to revision--and represents a work in progress. An In-depth Analysis of a Critical Aspect of the Cold War: The Soviet Manned Lunar Programs, from the American and Russian Perspective. Declassification of formerly classified U.S. intelligence imagery, documents and the former Soviet Union/Russian space industry histories are helping fill in large gaps in the historical record of the Soviet side of the manned Lunar race as illuminated by both Russian and American perspectives. 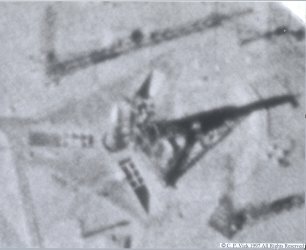 Until the U. S. intelligence community declassifies the KH-8/Gambit and KH-9/Hexagon imagery covering the years 1966 through 1975 of the Baikonur Cosmodrome "A", "G-3", "G-4", and "J" infrastructure, or provides access to this imagery (and their associated analytical reports) through the existing executive order access to classified information for historians for historic documentation. Then the National Geospatial-Intelligence Agency (NGA), Central Intelligence Agency (CIA), Defense Intelligence Agency (DIA), and in part the National Security Agency (NSA) and the Air Intelligence Agency (AIA) can appropriately be labeled as "holding history hostage" for no justifiable reasons from the American citizens and especially the space policy lessons learned. This is because it does not affect sources and methods that they have already publicly defined from previous declassification. This present research report covers a ten step process to identify the data that can now be defined from open sources in spite of it not having yet been declassified by the U. S government. "How much information with what kind of revelations could in fact be revealed that can be readily ascertained from open sources, effectively removing the reasons for continuation of the classification of this thirty year old film based imagery for them?" Human ingenuity will continue to find ways to get over, under or around the U. S. intelligence community=s negative responses to declassify this thirty-year-old-film-based imagery, regardless of its futile attempts to stop or reverse the declassification of history process in the United States of America. J. 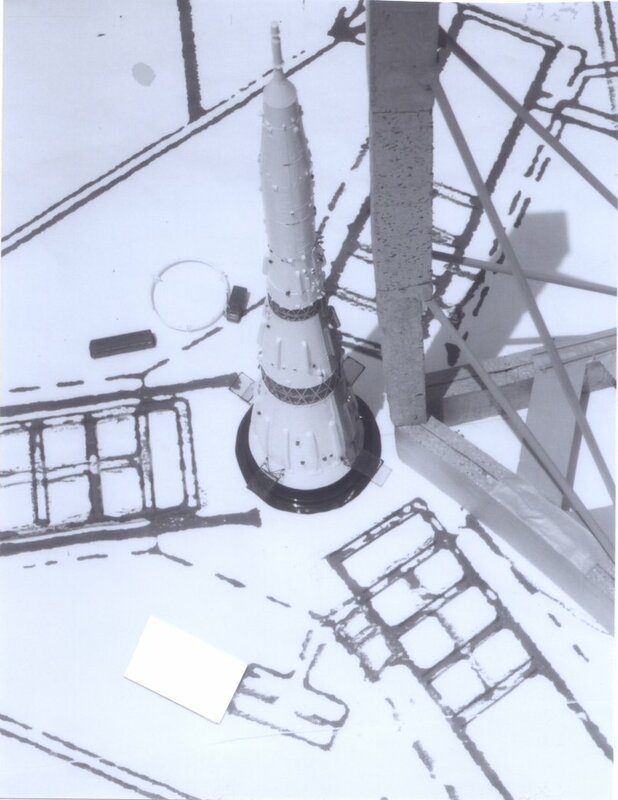 Developing a series of physical model of the "J" vehicle and parts of the launch facilities infrastructure to do photo simulation of the imagery that have been described through interviews and is available from Soviet official events descriptions along with the ground track plot viewing azimuth angle effective finishes defining all of the images taken by the KH-8, & KH-9 reconnaissance spacecraft series of the Soyuz SL-4, Proton Zond/SL-12 and N1-L3/"J" vehicle and their launch support infrastructures. This is a site specific debrief of interviews (Not included in this article because it is peripheral to the content) with attributed community, and none community or retired sources once in a position for a need to know that describes the "J" vehicle and its facilities in some detail. All the information gleamed from those interviews was used to create the simulated images here in displayed, along with considerable facilities infrastructure equipment details released by the Russians and tourist snap shots since 1989, which in turn is backed up by the declassification of U. S. CORONA KH-1-4B and KH-7/Gambit imagery. Since it has been over 30 years since these events and following the 25 year declassification policy of the US Government I am disclosing some of the sources that include these and the information derived from the statement of the late NASA administrator James E. Webb and the late Col. Mitchell R. Sharpe, Dr. Charles S. Sheldon II, and other irrefutable private information sources that demonstrate the incredible luck U.S. intelligence had from very early on in catching the "J" vehicle in the horizontal position for technical analysis. Those living "Private Information sources" will not be identified because the KH-8 & KH-9 programs have not been declassified. I had described to me by the late Col. Mitchell R. Sharpe, and other irrefutable private information sources, as a researcher many years ago the KH-7/Gambit, KH-8/Gambit, and KH-9A Hexagon, big bird imagery/photographs. They were of the early gray-and-white and (much later) near all white SL-X-15/N1-L3, "J" vehicle booster of the Soviet manned lunar landing program. 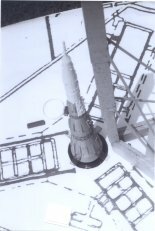 The Soviet Saturn-V the N1-L3 was viewed from above its three directional flame jet deflector launch pad facilities about 20-30 degrees from true vertical. 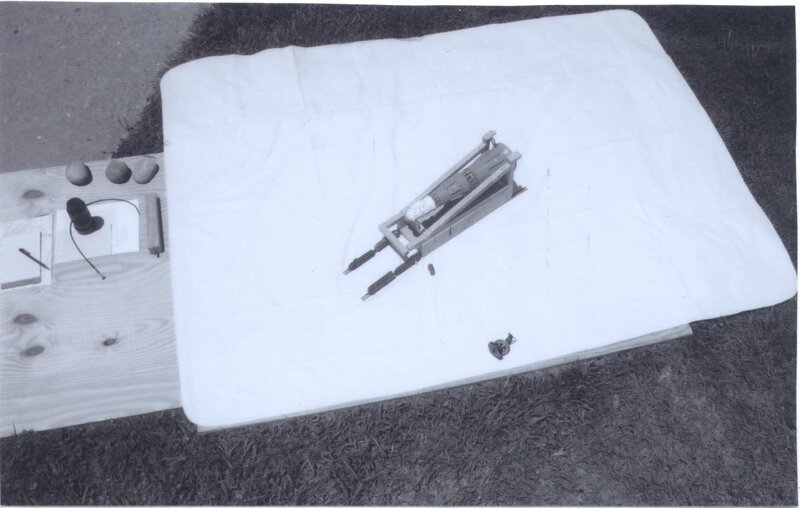 (See Figure-53) It was also seen and analyzed when it was being rolled out horizontally both with (and without) its head white colored L-3 lunar payload attached among other details. 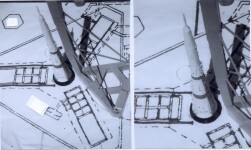 (See Figure-54, 55) The prior to, and afterwards July 3, 1969 pad launch failure pictures have been declassified. It has also been described publicly and to me in more detail. 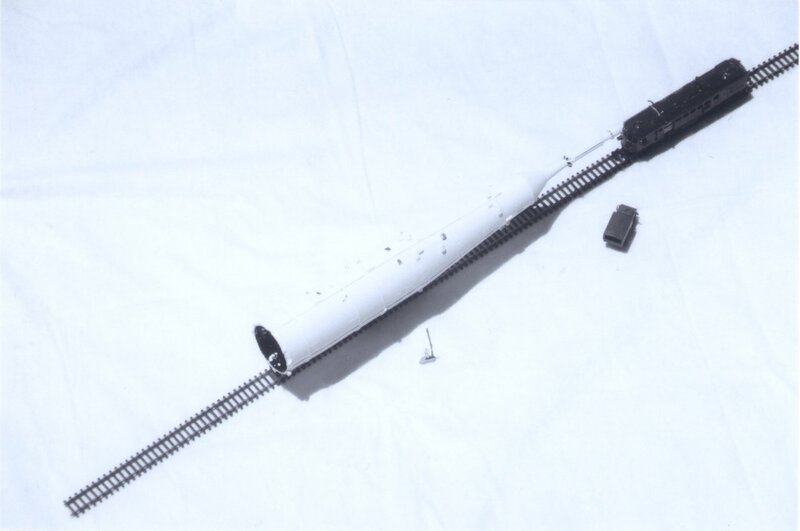 In the last several years the Russians have published the actual descriptions of when those individual configurations of the N1-L3, "J" vehicle booster were rolled out through early 1969--although with some errors corrected by CORONA--but not afterwards confirming the details I have been told in the past. 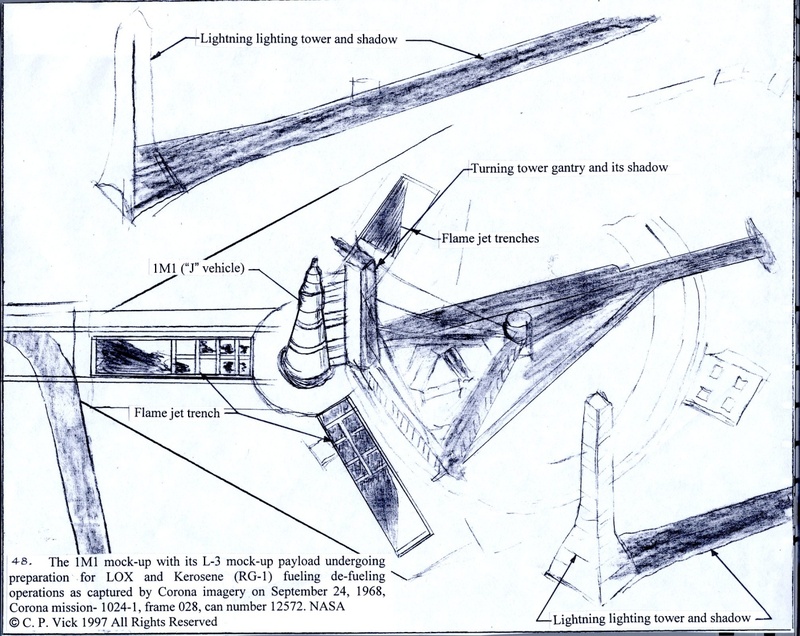 Subsequently on June 16, 1980, Aviation Week and Space Technology published a drawing of the "J"- vehicle that was based on the 1968 assessment as later published in the 1971 NIE 11-1-71 on the Soviet Space Program, pp. 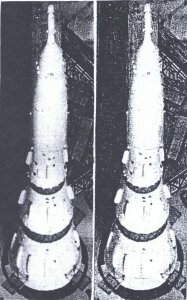 10 & 13, and the other Soviet launch vehicles as they were then understood. 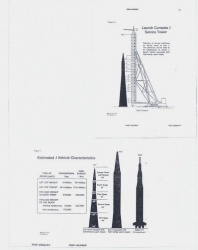 (See Figures 1 & 2) It still carried the same dimensional errors but essentially showed a tapered three stages with a cylindrical fourth stage along with a large first, second and second, third stage inter-stage area still not correctly defined even though it was understood by the community from the available imagery. 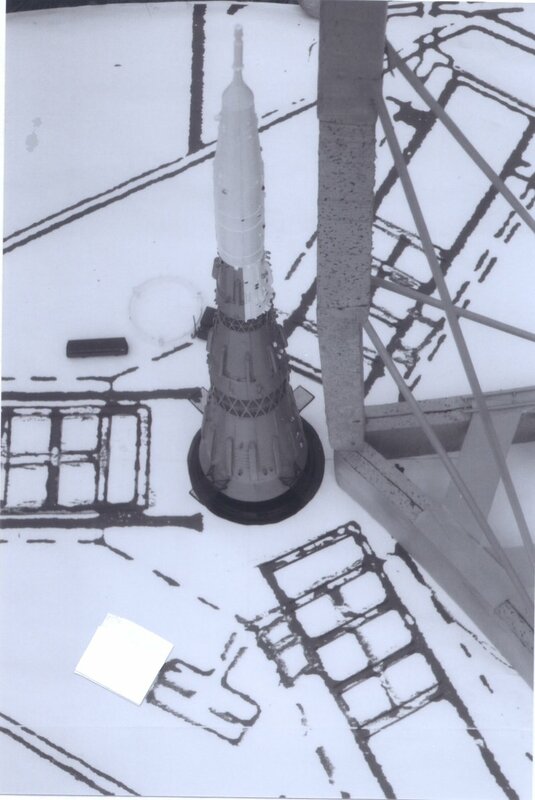 Even the Soyuz Safety Assurance System/ Launch Escape Tower solid motor nozzles were identifiable with this KH-8 imagery. 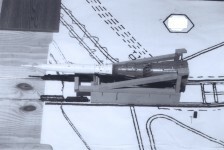 "The horizontal rolls out of the "fat bullet" shaped booster (first three stages with no head white colored L-3 payload part) in which the engines on the first stage could not be seen, and that the inter-stage grids were blanked over", is among them, yet to be declassified images except for the pad views. This last picture is said to be "rather dark in contrast when it was taken", (on November 2, 1967 based on orbital Two Line Elements analysis and November 3, 1967 based on official Russian Baikonur Cosmodrome released information). This rollout configuration has in fact been described in open Russian literature on N1-L3 and as documented in ref 1. 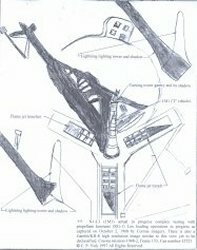 (See figure-54) While working in the industry, irrefutable private information sources observed this image and other of the developing "J" facilities infrastructure and "J" vehicle in late 1967 while reviewing file drawers full of imagery analysis reports. 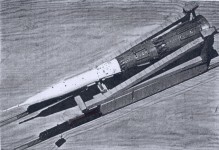 It was the first image the U. S. acquired of the N1 booster's first three stages. 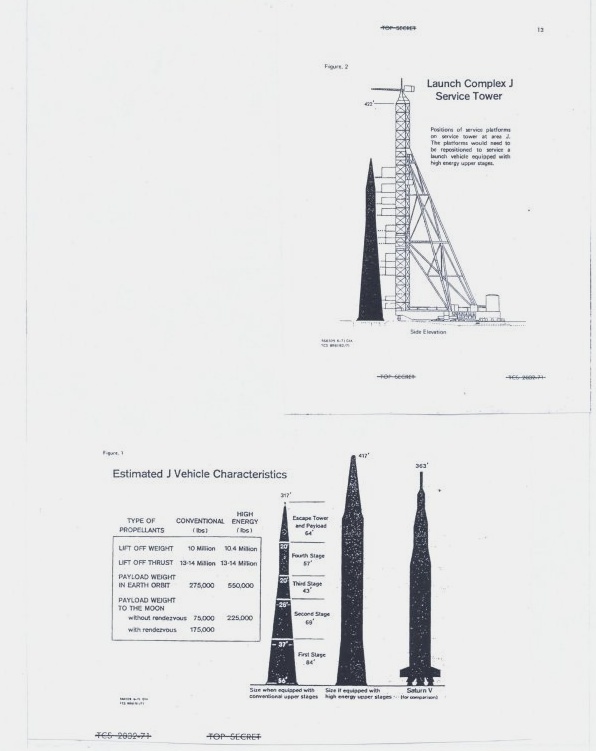 While the first US image of the N1-L3 total stack was not captured until December 11, 1967. Both images were rather poor, incredibly better ones would follow. They gave US intelligence good glimpses of how very different this booster was from what had been suggested much less expected. 1, 2, 3, & 4: The known KH-4B, and concepts of the KH-7, KH-8A/B and KH-9A imaging spacecraft based on publicly published descriptions and launch photo analysis information. 52. 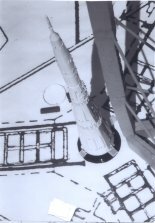 Example of KH-8, Class Quality Image information: The standard KH-8 higher resolution view of the "J" pad & gantry is that exemplified by the September 24, 1968, Corona image Figure-49. Further supporting this is the information illustrated in the NIE 11-1-1971, The Soviet Space Program, July 1, 1971, pp. 10, & 13. Figure-1: The (Estimated J Vehicle Characteristics) is the early results of community wide analysis of the vehicle's performance. Interestingly Figure-1 shows the typical; "J" vehicle, 1M1 design without the launch escape tower/safety assurance system solid motors stacked on top of the nose pedestal. This indicates that NPIC correctly analyzed the total height within a meter or so of the true dimensions. 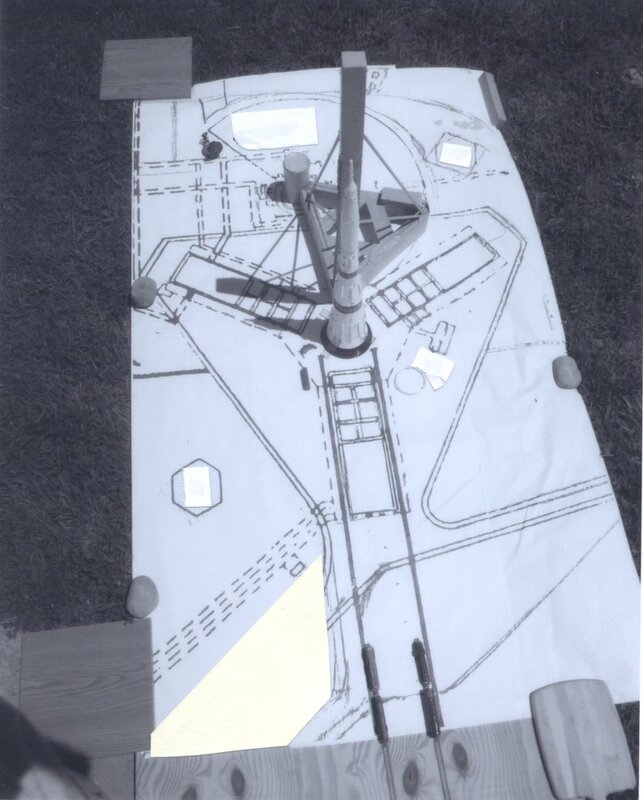 Figure-2: The (Launch Complex J Service Tower) is a down graded technical illustration of what was internally understood by U. S. intelligence community from GAMBIT imagery. Much more detailed drawings have yet to be declassified from this and other views. Figure-2 is also the primary view taken by most of the KH-8 missions for the ongoing engineering analysis of the "J" vehicle and its support infrastructure. J. Physical Model of the "J" Vehicle and Parts of the Launch Facilities Infrastructure to Simulate the Imagery Described. It should be clear by now that those images can be physically replicated in high fidelity scale models and that, in turn, can be photographed using time exposures with a range of small aperture "F" stops and a telephoto lenses, then printed through smoked glass or filters to achieve desired results. This would effectively duplicate the KH-8A & B and KH-9A images (that remain in secret and top secret format) as illustrations of what those images displayed. After all, that is what the Intelligence community did to check their analysis of the "J" and "G-3, G-4" launch facilities and other global facilities. 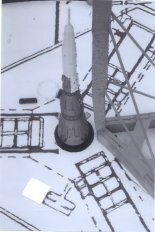 Developing a physical model of the "J" vehicle and part of its launch facilities infrastructure makes feasible creation of simulated duplication of the overhead imagery. 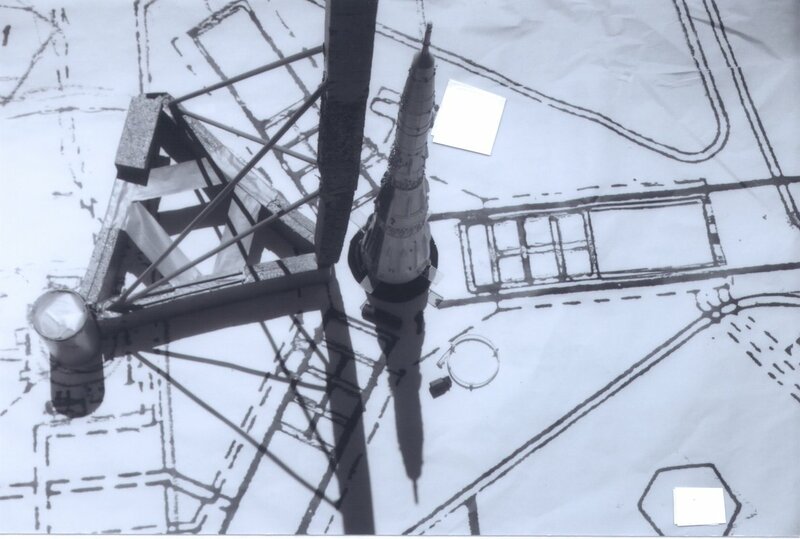 While thinking about how to create a series of examples of a "secret" level and "top secret" level Gambit and Hexagon images that have not been declassified yet, this researcher realized this could be done through combining model photography and drawing work on the photos or on Mylar in place of doing a complete pad facility model as an initial attempt to simulate the imagery. © C. P. Vick 2004 All Rights Reserved. Cross referencing of the official data from the former Soviet Union/Russian Baikonur Cosmodrome on the N1-L3/"J" vehicle activity records discussed in reference (1) permits identification of the actual dates, and in what those activities consisted. It often shows that the official Cosmodrome dates or Moscow time dates though correct are listed as such for one day later than the U.S dates because of the reference time zone differences and the actual completion of the event dates. 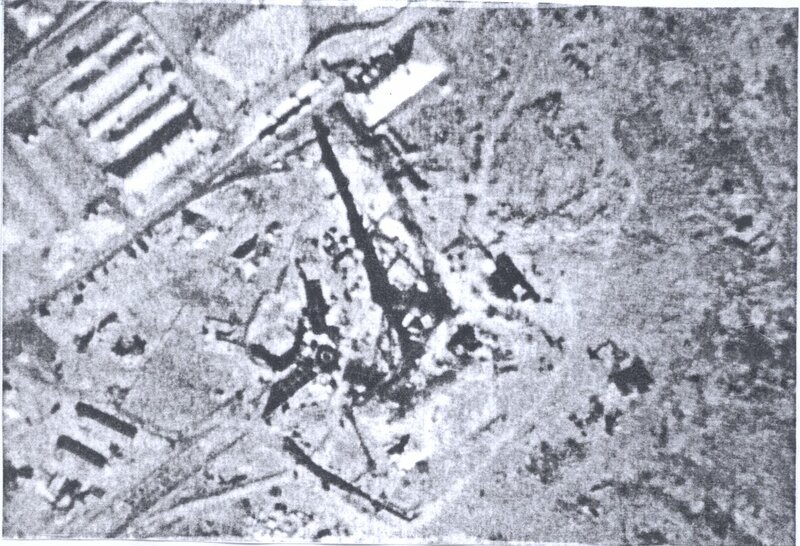 Only much later did US intelligence understand that the many countdowns monitored through SIGINT from the Tyuratam "J" vehicle infrastructure actually were ground testing operations designed to test the facilities infrastructure, the booster system and new personnel training in lieu of none existing ground test, training facilities. Available declassified and classified Russian photos, film and video information on the Soviet manned lunar hardware released since 1989 have revealed design differences, and paint scheme differences in each N1-L3/"J" booster set up on the Baikonur Cosmodrome for personnel training and testing of the launch vehicle. This allows identification of the configuration details observed during various U. S reconnaissance missions. Cross referencing of the CORONA/KH-1-4B and KH-7/Gambit Imagery of the "J" vehicle on its launch support infrastructure and the associated reports have confirmed, contradicted and added to the official Baikonur Cosmodrome activities data. The images have enhanced the understanding of the launch infrastructure development beyond what was already understood from previous works this historical researcher has published. It is apparent that CORONA defined what would be the imaging parameters for the follow-on, high-resolution KH series. For example if there was a low resolution image, a paired high resolution close up image from a similar view. The intelligence community needs to realize that these reconnaissance satellites (RECSAT) pictures/images (with the associated documents) provides accurate context to a history that cannot otherwise be documented for the former Soviet Union (as well as that of the Peoples Republic of China). It represents a significant source of certainty of events in the histories and environment of these countries and the critical lessons to be learned from it by this and future generations to come. All by itself, this imagery is literally the only way available to accomplish a cross check on the accuracy of Russian historic documentation statements. This is especially significant when reconstructing a history of the Soviet manned lunar program=s Soyuz/SL-4, Proton-Zond/SL-12 and "J" vehicle/SL-15 roll out and roll back dates. Literally the official records of the former Soviet Union are being contradicted by the CORONA imagery forcing a rewrite of some of those records. The record to date, using declassified CORONA film-based imagery, has shown a wide difference from what was documented versus what can be seen of what the Russians have built and what they were doing with what they built. The credibility of official US intelligence community classification policy is called into serious question by multiple agency efforts to withhold information that can be readily ascertained from open sources that can be duplicated in considerable detail as is demonstrated by this study. What other problems does this continued classification solve for the community beyond job security, and job justification is reviewed by references 6 (appendix - A) & 7. Specifically, I am searching for those pictures described here in.. This follow-on film-based, imagery must be declassified in time to allow for interviews of aged people reflecting this imagery knowledge to be conducted with the people who were the leaders and policy analyst makers of those times before they all pass away leaving large historical questions unanswered forever. Even the old timers of these classified programs are complaining that they will die before they can ever talk about their lives work maintaining the peace during the Cold War. In the final analysis, both a "calendar mission duration" and "computer based analysis of the orbital ground tracks along with the spacecraft viewing off nadir angle and range focal distance details" of the KH-8A and B and KH-9A and B missions (using publicly published mission two-line-elements) have defined the days when the orbital passes would have produced scenarios where imagery could have been taken; however it does not confirm that those imaging spacecraft were commanded to take images on those days. That is answered by studying the precursor KH-7 operational practices characteristics. It also does not define the weather conditions on those days, but weathers should be obtainable from historic NOAA weather records publicly available. 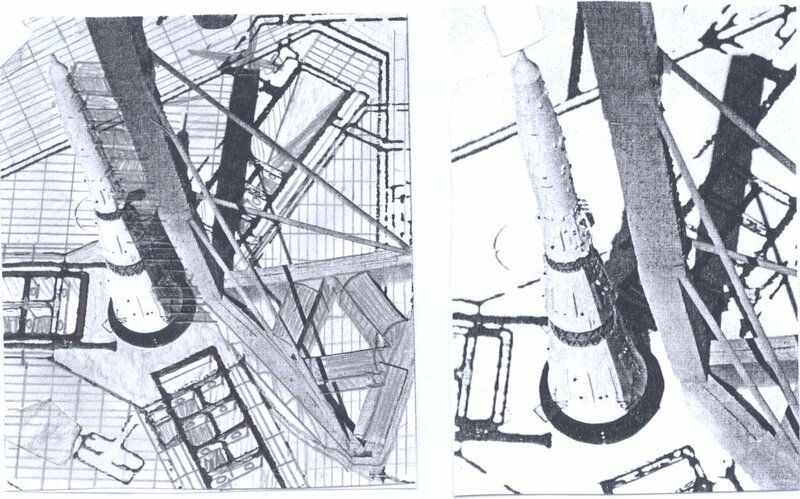 Assuming the imagery was taken, and is catalogued (which it is not) it will define in considerable detail how those images were taken---especially of the Proton site 81 (left and right facilities infrastructure) and the "J"-facilities infrastructure and its SL-X-15, N1-L3 lunar booster. In turn, this will tell what was known by the U.S. intelligence community, versus the official Soviet/Russian records from the Baikonur Cosmodrome. Unfortunately--reviewed by references 6 & 7-- that is exactly what the community does not want to happen but the "cat is out of the bag" from their own previous declassification actions. Confirmation requires access to the KH-8A, B/Block-II, Gambit and KH-9A Block-I/Hexagon primary imagery and the declassification of related document report. To repeat, all of this in effect already has been declassified when the CORONA imagery was declassified in 1995, back-up by the Russian declassifications from the late 1980's and 1990s. The protection of sources and methods of how we knew about something, what we knew, and when and where on various facilities may be sensitive inside the intelligence community but it already has declassified any such sensitiveness with the CORONA / KH-1-4B, KH-7 / Block-I Gambit and some of the KH-9 / Hexagon film release so why try and turn back the declassification clock. Use of KH-8 and KH-9 mission orbital "two line elements" data sets with a modified astronomy satellite observation computer program can be used to obtain accurate geographical "Swath Footprint" of overhead satellite passes. The idea here is to find when the ground track of these satellites that went through the indicated imaginary orbital target circle in order to cover the areas of the Cosmodrome of interest. The circle in the sky is the ground observer view of the satellite from the target. It is based on the known minimum slant elevation angle of 20-30 degrees above the visible horizon or the known satellite slant swath angle from nadir of a maximum of approximately 35-60-70 degrees depending on which satellite is involved. This is based in part on the elevation angle at the minimum range to the point of target interest which should be near the center of the pass through the circle in the sky. It also depends on the sun elevation angle to the horizon for lighting conditions at the target. The circles would encompass the target coordinates on the ground and represents the observable area in which the satellite can take the images. The low point of the orbit Perigee is over the northern hemisphere over the USSR and the high point Apogee is over the southern hemisphere. It is possible to narrow it down to the day and approximate time of day of the interception of the target area. All of the launches are from the Titan launch sites on Vandenberg AFB, Calif. USA. The nadir is actually a reversed cone in this case in the sense that the larger diameter is in space while the small diameter is the ground area around the target coordinates. 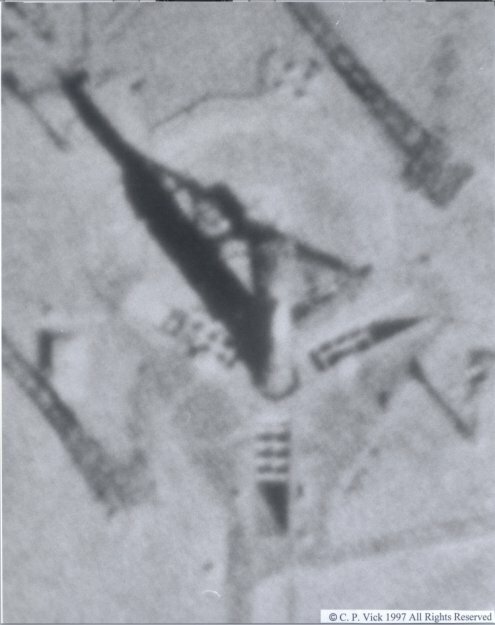 The imagery should overlap with the A and J facilities as seen in KH-7 Gambit imagery practices. While the imagery of the G-3 and G-4, the Proton 81L, 81R facilities were imaged on a separate orbital pass as seen in the KH-7/Gambit imagery practices. When looking at the defined KH-7 and especially the KH-8 derived imaging capability, it has to be remembered that the cameras had the ability to rotate through the centerline of the spacecraft lengthwise to get the images above the 70 degree half swath angle or a total KH-8, 140 degree swath capability like KH-7 but there has to be a limit to that camera system to take images at longer range distances than 325 km. (from basic trigonometry). Anything much over 325 km range is just not real even if pushed to infinity before it resolution becomes even less than CORONA imagery's, which had a range of 216.9848 km. This is to say that the KH-8 had a high-resolution capability out to about 220 km off nadir slant angle range and a low resolution capability out to a range of perhaps 325 km. It was directed from time to time to operate outside of the 0-35 degrees nominal imaging off nadir angle for some high value targets at lower resolution. This, then, defines the limits of the KH-8 imaging system. The range limits of the KH-9 imaging system with a 120 degree swath or a 60 degree half swath is 324.6962 km. (from basic trigonometry). Certainly ranges over 400 km or 500 km or 600 km and even 1,000 km or more is unrealistic for any kind of useful imagery resolution. 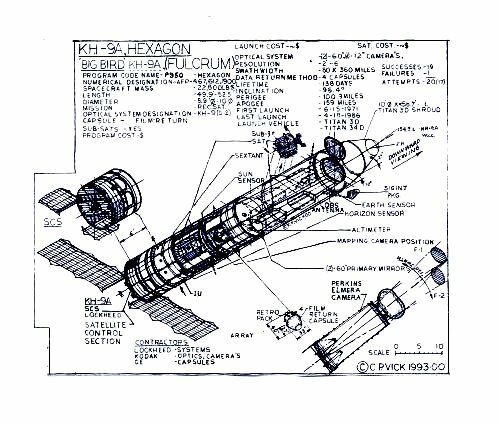 The best resolution images were obtained from the near vertical range viewing angle for the KH-1 through KH-9 spacecraft series. 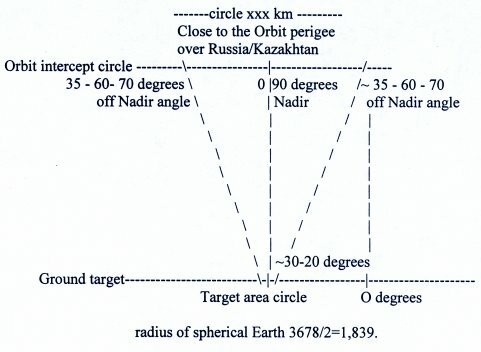 Practices for KH-1 through KH-9 observed indicate a 0-35 off nadir angle limits was the operational rule with few exceptions that was combined with the minimum range to define the best passes for observing a target. Looking at the KH-7 GAMBIT Block-I known image swath and assuming instantaneous imagery using the satellites average altitude seen in both KH-7 and KH-8 imagery indicates that the actual minimum viewing elevation is 20 degrees above the horizon from the targets viewpoint with the off nadir angle at a maximum of 70 degrees viewing capability. The smallest nadir angle, shortest range and sun elevation were used. As nadir angle increases, resolution decreases due to increasing range, and the effects of the curvature of the Earth. The "J" and "A" facilities were usually imaged together while the "G" facilities were imaged separately. US time versus TT time can vary by one day. Looking at the passes one serious question is what governs the imagery choices Nadir angle or Range distance? In many cases the images were 20-30 degrees off vertical which tends to say to this historic researcher that the Nadir angle was critical but that the range i.e. : which ever gave the shortest distance to the target from the satellite was in fact the governor. Range is relevant to the intrinsic resolution of the camera. Nadir angle is relevant to Earth's curvature - surface features near the horizon are seen at a severe slant angle, which greatly reduces what can be seen, regardless of the resolution of the camera. Of course, range and nadir angle are mathematically related, and for spacecraft with a nearly constant operational altitude, a given nadir angle will always correspond to about the same range. Although the Gambit orbits were fairly elliptical, most of the imaging was performed near perigee, about 134-140-148 km altitude, which was positioned near the targets of interest. The latitude of perigee processed fairly rapidly, but the missions were of short duration, so this was manageable. What surprises this researcher is that in many cases the imagery for KH-8 with a potential 140 degree swath may have covered all three sites in one pass which is different from what was actually done with KH-7 even though it had the same characteristic. In actual practice that is questionable. A knowledgeable source tells this reporter that for targets of great importance, the KH-8 could be aimed considerably more off nadir. 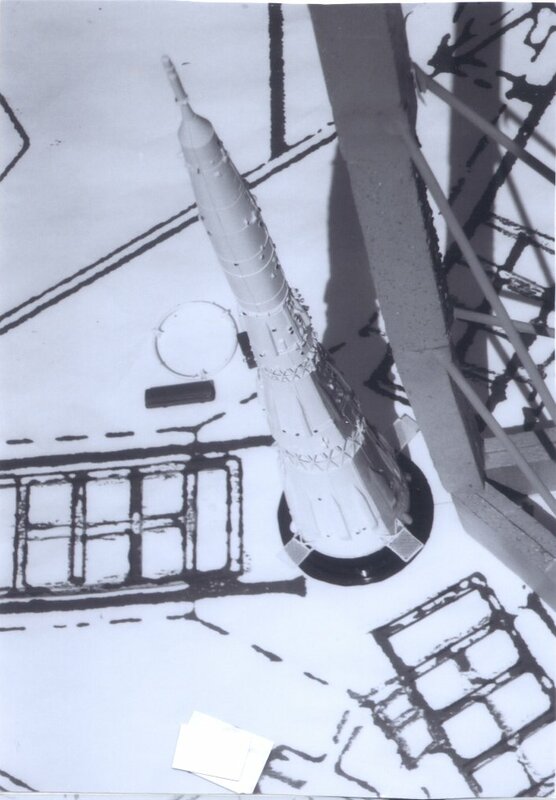 This source suggests that the huge Soviet "Moon Rocket" the "J" vehicle would have been a prime candidate for extreme off-nadir imaging, because of its size and regardless of the resolution. Imaging past 35 deg nadir should be considered the exception to the rule, though given the target, probably reasonable. 1. 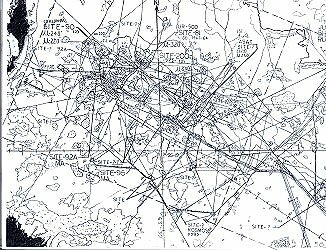 CORONA KH-4B swath was a 70 degree cross span with a maximum of 35 degrees off Nadir angle with a 5 degree width. This provided an imaging area with a minimum of 17.79 km. wide and 268.69 km. long. 2. The average KH-7 GAMBIT Block-I altitude was 148.3820 km is known to have used a maximum of a 140 degrees swath providing a known 741.2 km by 22.2360 km imaging area potential. (3) The average KH-7 altitude yields a 22.2360 x 370.60 km half swath imaging area using trigonometry. 3. When the highly refined KH-8 GAMBIT Block-II imaging system was introduced it provided the best imagery that was to come out of the GAMBIT film-based imaging systems over the KH-7 / GAMBIT Block-I system. While the average KH-8 altitude was 134.5124 km yields a swath imaging area of 739.14 x 20.1579 km. 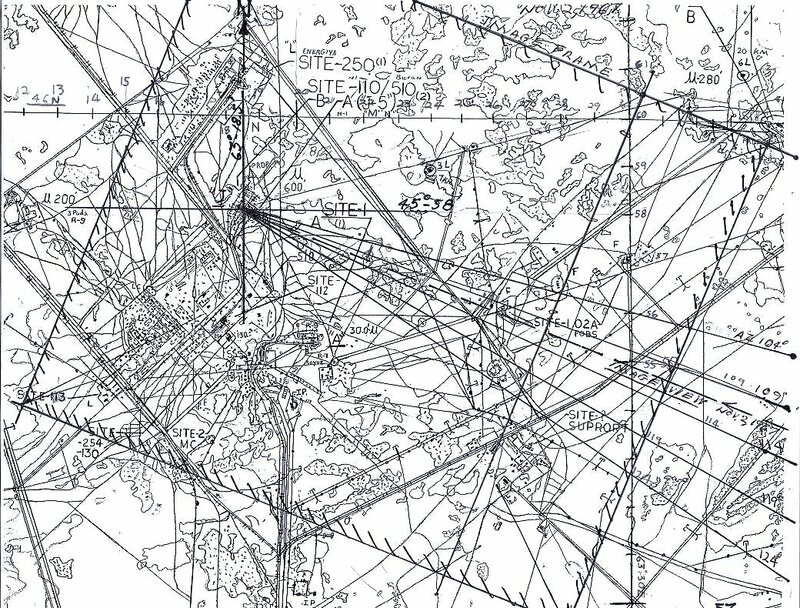 using trigonometry and assuming the same limits of 20 degrees and above elevation minimum view from the target area or 70 degrees off nadir angle from the spacecraft for a 140 degrees total swath potential. 4. The KH-9 imaging capability had known limits of 30 degrees elevation from the target or 60 degrees off nadir angle which yields a 120 degrees swath potential imaging area capability. The KH-9 imaging system apparently used the same KH-7, 8 film used in the CORONA format. The wider frames provided for higher resolution Hexagon images. So, what is the amount of imagery we are actually demanding to be allowed to see for historic documentation? Based on the known KH-7 coverage experience for the three sites desired with one overlapping in the same frame there will be between 124 and 164 frames of missions 1709-1744/KH-8 images and between 176 and 264 frames of missions 1901-1911/KH-9 imagery for a total of between 300-340- 428 frames to be reviewed. Because the image frames overlap one site the lower suggested numbers of frames is closer to the actual figures of what is expected. This also deletes the two KH-8 launch failures. The orbital "Two Line Elements" analysis of the missions did reduce this considerably. Even the lower numbers are expected to be high in contrast to actual number due to no coverage due either to cloud cover or no images being taken of the target area on some of the missions especially after 1970. A total of 300-428 frames, if that many is truly a small number of frames compared with the totals taken on all the KH-8 and KH-9 missions that is estimated to be about 47,500-50,000 frames through June 1976 for KH-8 alone. On a preliminary basis it appears to come down to a total of perhaps ~72+/- useful images were obtained of the "J", "A" & "G-3, 4" vehicles and infrastructure with two to four images per returned bucket. It in fact turns out that only about 50 or so images are that useful. The rest of the images presumably merely showed details of the infrastructure development construction expansion progress and new additions to the infrastructure seen in the CORONA imagery. Many of the critical events conducted by the Soviets with the "J" vehicle occurred between KH-8 missions because their flight pattern launch times and duration were quite predictable and proved to be consistently into the 1970's. Whether holding back the hardware in the facilities was by design on the part of the Soviets remains uncertain through not unexpected because we did much of the same thing responding to their imaging systems. After 1970 the imagery coverage seems to have dropped off from its earlier overall intensity. 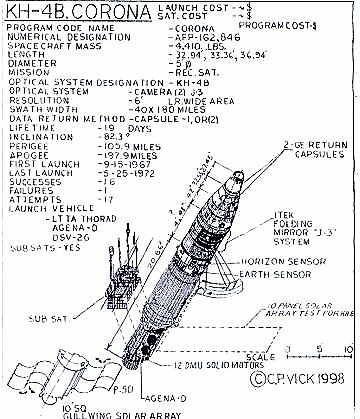 All the KH-8 imaging missions were entirely predictable because of the orbital mechanics used by the imaging spacecraft for the Soviets. Typically imaging took place early and late in the missions. There appear to be almost no mid-mission passes for imaging. This predictable pattern was somewhat interrupted by the KH-9 and latter KH-8 programs with much more film and longer duration performance capability. All passes that rose above the horizon, no matter how low were reviewed. Also, included are the sun elevations as low as -0.833 deg, since that corresponds to the limb of the sun touching the horizon, due to atmospheric refraction near the horizon. As a result, a large number of marginal and probably useless passes have been output & reviewed. No passes prior to the time of lift-off are included. The RAE Table of Satellites almost always gave the re-entry date one day later than the date range. The RAE re-entry dates were used as the cut-off, to ensure that no potentially useful passes were missed. Defining the area imaged from the derived satellites ground track plot with its imaging swath area laid over the ground track plot and the satellite viewing angle frames all of the images taken by the KH-8, & KH-9 reconnaissance spacecraft series in considerable detail that can be photo simulated. This is a review of the cloud cover weather conditions observed from space over the Baikonur Cosmodrome during the two line element imaging defined dates based on the NOAA weather imagery. Unfortunately none of the imagery negatives are catalogued prior to 1979. They have the unorganized negatives of the existing satellites of that era like the Nimbus series prior to 1979. NPIC was known to have acquired the images and it is interesting that the approximate midnight July 3, 1969 image is apparently missing and unavailable. Of course one of the images in question may have been taken by an early military weather satellite. The weather imagery copies for the period July 3, 1969-around 20:18:32 GMT/UTC plus 5 hours = 25:18:32 = 1:18:32 GMT/UTC of July 4, 1969 early morning night local time world weather view for the same coordinates listed below? The following, table reports effectively circumvent the CIA, NGA communities negative response to this authors request for access to classified imagery/information for historic research project documentation as provided for by the existing Executive Orders (as written in the CIA, DoD applicable regulations), as they continue to hold history hostage from declassification the classified KH-8/Gambit, and KH-9/Hexagon imagery historic top secret information. This information is based on open sources irrefutable facts leaving little doubt that it is as accurate as can now be documented and leaving few unanswered questions about what this still classified imagery historically displays. What is so eye opening is that it is the Russian data that has made this possible along with some Western data analysis. Why the community can not declassify these 50 or so images only is beyond comprehension. KH-8-13 (51) April 17-April 28, 1968 4-26-1968? IR weather imageJuly 3, 1969-20:18:32 = 25:18:32 =1:18:32 GMT/UTC July 4, 1969 early morning night launch.
? - Based on KH-7 imaging practices it is questionable whether imagery of the "G-3, 4" facilities was possible on the same passes used to capture the "J" & "A" infrastructure image. ** Indicates the imagery was of high priority but was accomplished outside of nominal required parameters for range and off nadir angle creating lower resolution images. KH-8 missions - 1, 2, 3, 4, 5, 6, 7, 8, 17, 20, 21, 24, 25, 26, 27, 28, 29, 30, 31, 32, 34, & 35 along with KH-9 missions 2 & 3 were not reviewed because no known "J" events occurred during those missions. Assuming any other dates requires that it be accepted that the much longer ranges from the spacecraft to the target for imaging were used which seems unrealistic based on the here in documented practices for KH-7. There are a total of 11 KH-8 and 4 KH-9 images of the "A", "J" & 10 of the "G-3, 4" facilities. A more detailed description is provided in table III. KH-8/Gambit, and KH-9/Hexagon Imagery: Satellite Two Line Orbital Element and "The Soviet Manned Lunar Race as seen through CORONA/KH-1-4B and Gambit/KH-7, Gambit/KH-8 and Hexagon/KH-9 Imagery, document report on Events in the Development of the SL-12/Proton-Zond and SL-X-15/N1-L3 Boosters. imagery KH Mission, duration Configuration of "J" vehicle & "G-3,4" vehicle imaged Where & what imaged/colors of the "J": vehicle N1-L3/L-1 and or "G-3, 4" vehicle Proton. Baikonur time end of test ops. Oct. 25 -Nov. 05, 1967 Three stage "J" vehicle 1M1 on TE (TUA) in horizontal position with no L-3 payload US intelligence with early incredibly good luck caught the three stage "J" vehicle in the open on the railroad causeway on its Transport Erector (TE) huge flatcar TUA with two pairs of diesel locomotives on two parallel tracks during a roll back or rollout test. This image is a very dark contrast oblique near forward view image with considerable wet ground after snow melt glare. The view was such that the first stage engines could not be seen. The booster appeared as a long "fat bullet" in shape or like a long reentry cone shaped warhead in appearance. It is all gray in color except for white on last third stage. Rounded top domes on the first, second and third stages and covered inter-stage trusses are visible. Apparently the activity started on Nov 2, 1967 but was finished on Nov. 3, 1967. 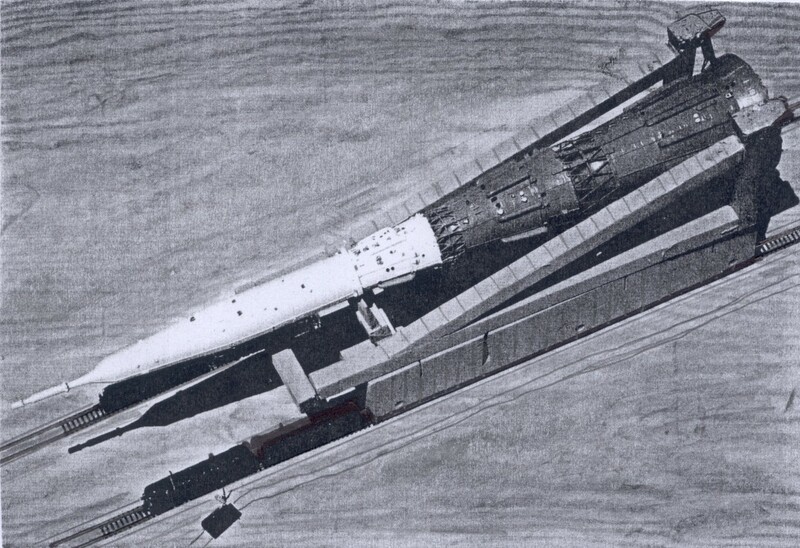 This GAMBIT image was the first image the U. S. acquired of the N1 booster's first three stages. While the first US image of the N1-L3 total stack was not captured until December 11, 1967 by CORONA. 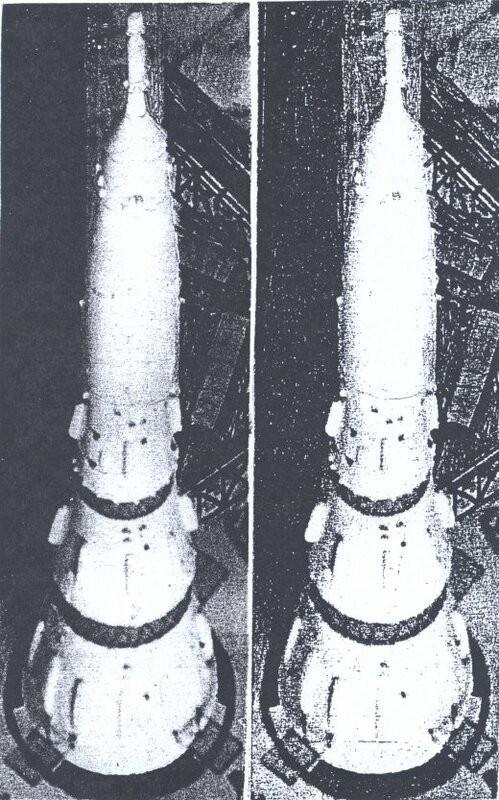 Both images were rather poor but better ones would follow but it gave the US intelligence community a glimpse of how very different this booster was from what had been expected. 2? ? Dec. 5 -Dec. 15, 1967 ("J" vehicle, (1M1) mock-up with an L-3 payload mock-up.) Possible un-imaged "J" vehicle on launch pad J-1, (East), gray first three stages with some white on the third stage and all white L-3 payload shroud with its Launch Escape Tower (LET/SAS). 1M1 is the Facilities Systems, Training, Logistic Vehicle (FST, T, and LV). 1M1 was rolled back before the 12-15-1967 imaging pass. 2 ? Jan.18, - Feb.4, 1968 N1-L3 & Soyuz activity? No vehicle seen on the facilities Suggestions of N1-L3 activity in addition to the potential Soyuz and known Proton Zond-4A preparation activity continue to be factually un-established because the GAMBIT imagery remains classified preventing historical factual establishment of these events that need to be confirmed or refuted. Proton Zond-4A was launched March 2, 1968. No additional activity is documented from Soviet era data for this period. These events were not covered by Corona imagery. 2? ? 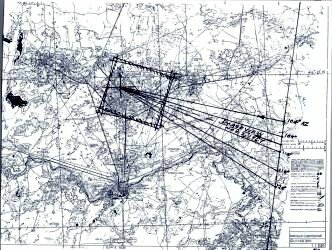 Jan.18, - Feb.4, 1968 Proton Zond (6L). There is the known Proton Zond-4A (6L) launch activity of 03-02-1968. No additional activity is documented from Soviet era data for this period. If this imagery pass analysis is correct then the vehicle was not imaged by Gambit KH-8-11 by one day. If the image was taken on 1-27-1968 along with the "J" & "A" facilities it would have captured the Proton Zond-4A on the pad. This event was not covered by Corona imagery. 2? ? March 13, - 24, 1968 No vehicle seen on the facilities? Suggestions of N1-L3 activity continue to be factually un-established because the GAMBIT imagery remains classified preventing historical establishment of these events that need to be confirmed or refuted. Proton Zond-4A was launched March 2, 1968. No additional activity is documented from Soviet era data for this period. These events were not covered by Corona imagery. 2? ? KH-8-13, Gambit-51 April 17.-April 28, 1968 (? ), "J" vehicle, (1M1) mock-up with an L-3 mock-up payload "J" vehicle on pad J-1, (East), gray colored first three stages and some white on third stage and all white L-3 payload shroud. The rollout of the 1M1 on 4-26-1968 was during or just after the 4-26-1968 imaging pass that required a slightly longer range that could have capture the full, N1-L3 vehicle stack on its horizontal Transport Erector/TUA during rollout. 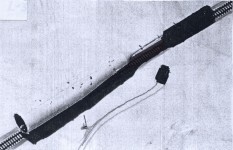 The date of the "J" vehicle's removal from the pad is unclear except that it was during April 1968. The gantry was rotated to the vehicle receiving position next to the pad. One additional imaging pass on 4-25-1968 required a slightly shorter range though the rollout would have been missed. Presumably the Soviets delayed the rollout by one day because of the predictable imagery pass. However, it appears that the predictable KH-8-13 imaging passes may have captured the rollout. Interviews of former U.S. government personnel strongly suggest that the "J" vehicle was imaged again with incredible luck mounted on the "J" vehicle Transport Erector during this period. 2? ? April 17.-April 28, 1968 No vehicle seen on the facilities? 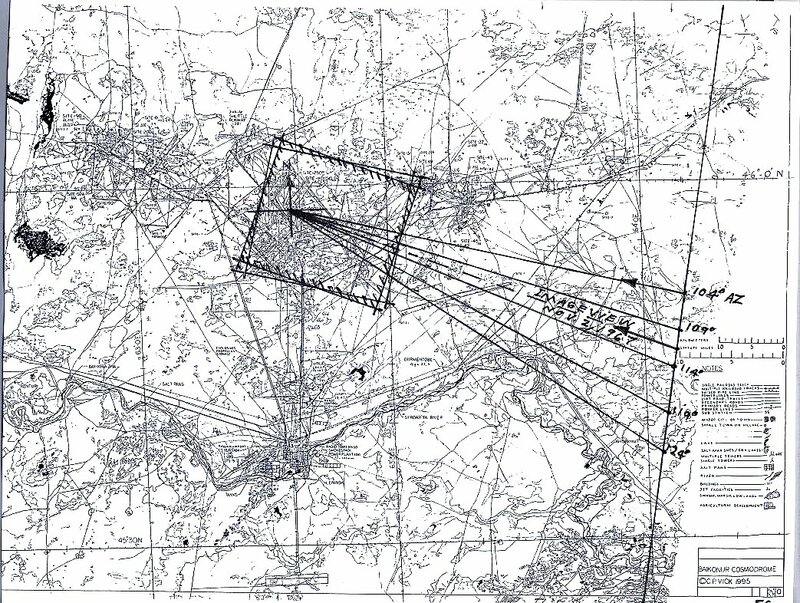 The Proton Zond "G-3, 4" facilities infrastructure was imaged on 04-25-1968. No Proton Zond on the launch facilities after launch failure 04-22/23-1968. 2? ? June 5,-June 16, 1968 No vehicle seen on the facilities? The Proton Zond "G-3, 4" facilities infrastructure was imaged on 06-13-1968. No Proton Zond on the pad. 2? ? June 5,-June 16, 1968 The first flight "J" vehicle # 3L booster sent to the pad with the first L-3S #3(L-1S) payload. First flight "J" vehicle installed on launch pad J-1, (East). 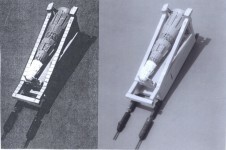 Gray colored first three stages with white on third stage and all white colored L-3 payload shroud with its LET. Date of the 3L, "J" vehicle removal from pad is unclear. Rollout of 3L was on 05-07-1968 and rollback was possibly before the 6-14-1968 imaging pass. If this imaging pass analysis is correct KH-8-14 failed to image the 3L flight vehicle prior to or during roll back. There are however other circumstantial public former U. S. Government and NASA Administrative personnel evidence that strongly suggest that the vehicle was imaged with incredible luck during this mission. Other imaging passes which are unlikely are on the 12th because of range and on the 13th that perhaps could have caught the "J" vehicle in roll back on its TE/TUA are uncertain. 2? ? Aug. 6- Aug 14, 1968 "J" vehicle, (1M1) mock-up with an L-3 mock-up payload. "J" vehicle caught in the open installed on launch pad J-1, (East). Gray colored first three stages with white on third stage and the all white L-3 payload shroud with no Launch Escape Tower (LET)/(SAS). The vehicle would remain on the launch pad for several mouths allowing multiple US imaging passes from different viewpoints. The declassified images from CORONA from this period viewing angles are similar to those used in GAMBIT imagery. 2? ? Sept. 10 -Sept 24, 1968 "J" vehicle, (1M1) mock-up with an L-3 mock-up payload. "J" vehicle 1M1 caught in the open installed on launch pad J-1, (East). Gray colored first three stages with white on third stage and the all white L-3 payload shroud with no LET/SAS. Preparation for the Soyuz 2, 3 missions launched from the Soyuz launch facilities 10-25/26-1968 while N1 activity was still in progress in early October 1968. 2? ? Sept. 10 -Sept 24, 1968 No vehicle seen on the facilities? 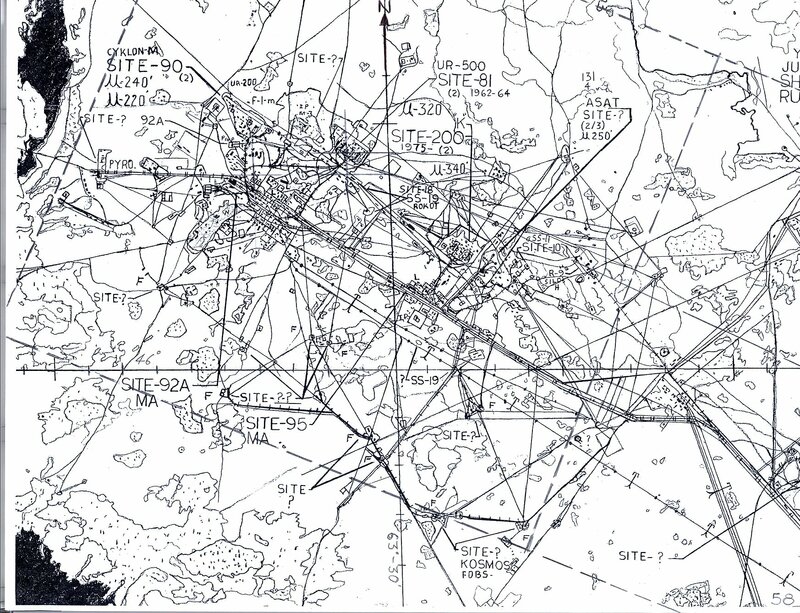 The Proton Zond "G-3, 4" facilities infrastructure was imaged on 09-24-1968. It was imaged after Proton Zond-5A launched 09-15-1968. 2? ? 12-(4-11)-1968 "J" vehicle with mock-up L-3 payload shroud and LET/SAS removed exposing the TLI, LOI stage and spacecraft internal shrouds "J" vehicle on J-1 pad (East), gray colored first three stages with some white on third stage. Vehicle upper L-3 payload internal stages and internal spacecraft shrouds exposed. Payload configuration different from what had previously been imaged. The external shrouds and LET/SAS are missing. The payload appears to be incomplete and foreshortened. 2? ? 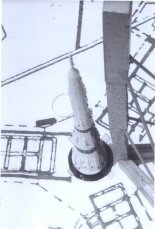 12-(4-11)-1968 tdSL-4 with Soyuz spacecraft "A" pad with Soyuz booster and Soyuz spacecraft in gantry, white shroud topped by the Launch Escape Tower (LET/SAS). Details of the LET/SAS clearly discernable down to the solid motors nozzles. Same as "J", 2? ? KH-8-18 Gambit-56 12-(4-11), 1968 No SL-12, LV identified SL-12, Proton-Zond pad G-4/81R empty gantry parked over launch pad. The G-3/81L gantry parked in rear off the launch pad. 2? ? Declassified Same "J" vehicle Same CORONA imagery report for "A", "G-3", "G-4", and "J" facilities all declassified. Cross reference study incorporated in "rollout" document. (1) 2? ? 2-2-1969 Three stage "J" vehicle 1M1 mock-up without the L-3 mock-up payload. Installation on the launch pad for testing of guidance system and finishing of the control systems, electrical systems tests. Engine heater systems were also tested. Insulation was added to specific engine pipes. Rollout and roll back was before the imaging pass of 1-28-1969 meaning that this "J" vehicle 1M1 was not imaged on the pad during this GAMBIT-8-19 mission. 2? ? 6-(3-13), 1969 SL-4 Soyuz Launch vehicle with Soyuz spacecraft? "A" pad presence of Soyuz indicated based on interviews with former U. S. government personnel but delayed .unresolved & uncertain resolution from the U. S. Intelligence community analysis viewpoint and it remains very sensitive to the community? Why, and what was its original purpose or mission? Same as "J" 2? ? KH-8-22 Gambit-60 6-(3-13), 1969 "J" vehicle 1M1 mock-up, with the L-3 payload mock-up with no LET solid motor "J" vehicle (1M1) on J-2 pad (West), first three stages white color with gray inter-stages with gray streak on back of the gantry side of the booster first two or three stages. J-1 pad turning tower gantry turned to receive 5L booster later. The 5L vehicle was not imaged by this KH-8-22/Gambit mission. This 1M1 vehicle was imaged on the pad during the KH-8-22 mission based on both then published information and information released from former U. S. government community personnel from interviews discussing the subsequent historic launch failure of the 5L vehicle. It was assumed at the time that the vehicle they had imaged on June 11, 1969 was the 5L flight vehicle that failed during launch, it was not. 2? ? 6-(3-13), 1969 Proton Lunar caught on pad. 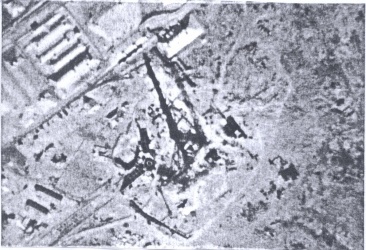 The Proton "G-3, 4"facilities infrastructure was imaged on 06-10-1968. Preparation for the white colored Proton Lunar Automatic Sample Return launch on 06-14-1969 caught in its gantry. 2? ? "5L" vehicle launch July 3, 4, 1969 20:18:32 UTC, = 25:18:32 =1:18:32 GMT/UTC July 4, 1969 early morning night launch. IR weather image? Sighting the 5L launch failure? NPIC retired employees confirm the images acquisition but not catalogued at NOAA. May have been an early military weather satellite image not declassified or available to the public. Aug. 22 - Sept. 6, 1969 "J" vehicle, (1M1) mock-up without an L-3 payload mock-up "J" vehicle on launch pad J-2, (West). All white colored first three stages only seen with no L-3 all white colored payload. J-1 pad being broken apart and excavated, cleaned up for rebuild. The gantry is undergoing a partial disassembly tear down of it upper third height. This has been described as "J" vehicle 4L on the pad with no LET but with the L-3 payload. But this makes it the 1M1 vehicle previously imaged by CORONA. This is questionable. 2? ? 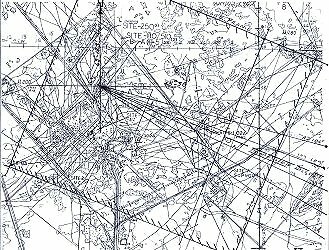 Aug. 22 - Sept. 6, 1969 The Proton Zond Lunar infrastructure was imaged on 08-29-1969. The imaging pass may have caught the Kosmos-300/Proton Lunar preparation. 2? ? Aug. 22 Sept. 6, 1969 "J" vehicle, (1M1) mock-up without an L-3 payload mock-up. "J" vehicle on launch pad J-2, (West). All white colored first three stages only seen with no L-3 all white colored payload. J-1 pad being broken apart and excavated, cleaned up for rebuild. The gantry is undergoing a partial disassembly tear down of it upper third height. 2? ? 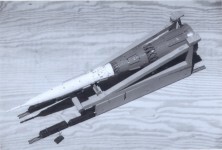 6-15,-8-5, 1971 "J" vehicle # 6L with the partial flight sample L-3 # 6 payload with LET/SAS. Third Flight test TT-05/"J" vehicle on the J-2 pad. Launched 6-27-1971. All white colored booster stages and white colored L-3 payload with LET/SAS and light gray white open truss inter-stages. 2? ? Oct. 23 -Nov. 16, 1971 "J" vehicle 1M2 (1M1-B) mock-up with a complete L-3 working payload mock-up. "J" vehicle rolled out and installation on launch pad J-2, (West). All white in color with light gray inter-stages. This is the updated modernized 2nd ground test, training vehicle (1M2) not the original N1-L3 Facilities System Test, Training and Logistic vehicle 1M1. 2? ? 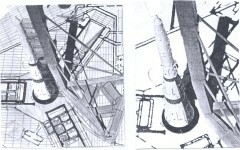 9-(1-29), 1972 The Soyuz facilities were imaged on 09-08-1972 and on 09-30-1972. 2? ? 9-(1-29), 1972 "J" vehicle # 7L with full L-3 payload with LET/SAS. L-3 shroud and payload partially disassembled for access to LOK and LK required facilitating fixing the problems. 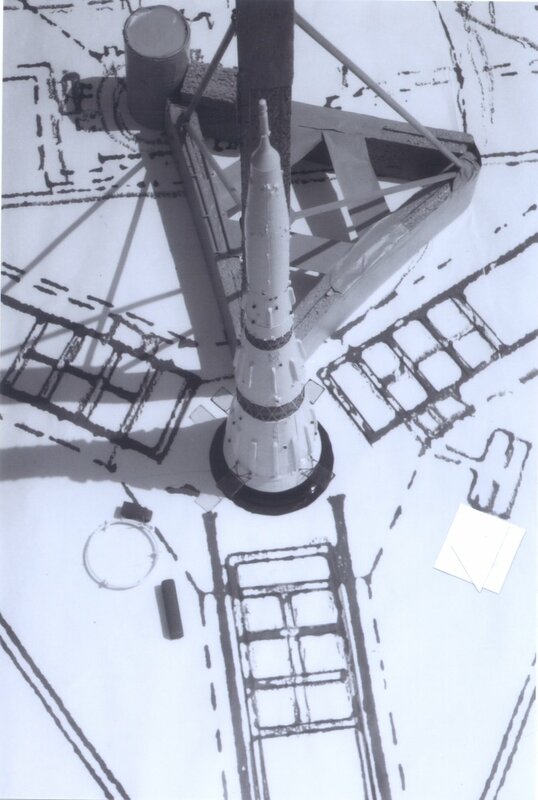 Fourth flight test "J" vehicle was rolled out and installed on pad J-2, (West) with L-3 payload which was later imaged partially disassembled by using the turning tower gantry crane on the launch pad and reassembly on the launch pad. It was successfully accomplished but never done before. Experimental Launch failure11- 23-1972. 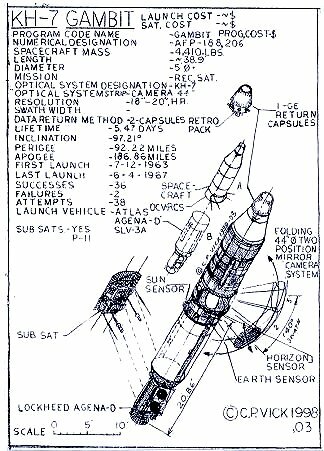 The New York Times article of 10-1-1972, confirms that KH-9 and KH-8 covered this disassembly event prior to its subsequent launch. Reported NYT, story of vehicle being dismantled in September 1972 is correct. Booster all white color. Upper half of shroud & LET /SAS disassembled visible. 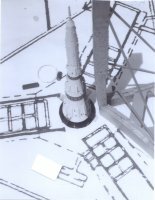 The first image of 9-8-1972 probably showed the "J" vehicle fully assembled on the pad before its disassembly image of 9-23-1972. (Lyons, Richard D., Moon Shot Delay By Soviets Likely, The New York Times, Oct 1, 1972 p. 52) 2? 72-1-7, 1973 "J" vehicle # 7L with full L-3 payload. Fourth flight test "J" vehicle with L-3 payload was partially disassembled by using the turning tower gantry crane on the launch pad and reassembly on the launch pad. It was successfully accomplished but never done before. Booster all white color. This image probably shows the vehicle fully reassembled. Experimental Launch failure 11-23-1972. 2? ? 11-10, 1973 -3-12, 1974 "J" vehicle 1M2 (1M1-B) mock-up "J" vehicle on launch pad J-2, (West). J-1 pad rebuild not yet finished. After this image the launch infrastructure took on the look of a moth balled facility. Rollout 12-20-1973 and rollback 02-06-1974 2? The author wants to thank the following for research Ted Molczan, Phillip S. Clark, and editorial assistance James T. Westwood, Peter Pesavento, John E. Pike and Steven Aftergood and other private information sources. 1.Vick CP. "The Soviet Manned Lunar Race as seen through CORONA/KH-1-4B and Gambit/KH-7, Gambit/KH-8 and Hexagon/KH-9 Imagery, 01-20-04." 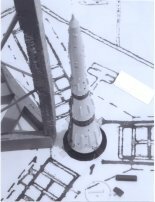 30 p. Soon-to-be-published Appendix from CP Vick's unpublished manuscript Unmasking the N1-L3: An In-depth Analysis of a Critical Aspect of the Cold War-the Soviet Manned Lunar Programs, from the American and Russian Perspective. 2. Vick, Charles P. "Reminisces of Conversations with the Late Doctor Charles S. Sheldon II," 03-30-04, pp.1-30. 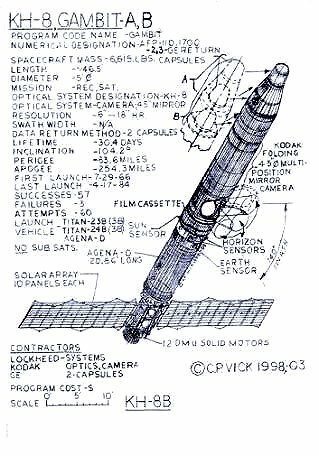 Soon-to-be-published Appendix from CP Vick's unpublished manuscript Unmasking the N1-L3: An In-depth Analysis of a Critical Aspect of the Cold War-the Soviet Manned Lunar Programs, from the American and Russian Perspective. 3. "Quick Facts" about the KH-7and KH-9 Mapping imagery, NIMA, fact sheet Sept. 20, 2002. 4.Recipients of Basic Imagery Interpretation Reports, Announcement of Three-Dimensional Scale Models Prepared by the National Photographic Interpretation Center, letter from Arthur C. Lundahl, Director NPIC, and date redacted 8 pages. 5.The Jonathan McDowell [jcm@head.cfa.harvard.edu] now [PLANET4589.org] web site for satellite mission durations and Orbital two line elements data base. 6. Vick, C. P., Futility of Redacting Historic Dates from the Declassified Photo Interpretation Reports, unpublished ongoing research report, 02-22-04, 2 p.
7.Vick C. P., "Holding History and Its Lessons Hostage, Reassessing the `Declassification of follow-on-Reconnaissance Satellite Imagery Expectations", unpublished draft ongoing research paper, 02-01-04, 7 p.
The redacting of CORONA Reconnaissance missions historic imaging dates, by the Central Intelligence Agency (CIA) for itself with requested direction from the National Geospatial- Intelligence Agency (NGA), and the Defense Intelligence Agency (DIA) is futility that should be stopped. These historic dates along with the images taken by the intelligence community's declassified CORONA and KH-7/Gambit reconnaissance satellite missions show various global sites of interest to the U. S. national security community during the Cold War. This redacting was done through the "CIA Historic Review Group" and or the NGA's new (HID) Historic Imagery Declassification Program. The offending declassified reports are the CIA's - National Photographic Interpretation Center (NPIC), Photo Interpretation Reports (PIR). The point is that these redacted dates can easily be correlated with the PIR dates and the CORONA Mission number which can plainly be found on the 1995 declassified CORONA film imagery at the (NARA) National Archives & Records Administration or on the United States Geological Survey (USGS) - (EROS) EARTH RESOUCES, DATA CENTER publicly available `web site data on CORONA imagery that can be studied or purchased backing up the answers for the redacted historic dates at least three or four different ways. This reflects very badly on CIA's "Historic Review Group" in the eyes of knowledgeable experienced researchers. It is a laughable reality when any body could go to the Cartography room next door to the Maryland division NARA library and look at the CORONA imagery to get those dates to play the game of fill in the redacted missing historic date's information as is being done. Certainly the CIA, NGA and DIA declassification reviewers have more important things to do with their time than wasting it in this futile game. This practice as of the last time it was checked continued unabated and intensified. Whether intended or not the NGA/CIA/DIA declassification redacting policy for the photo interpretation reports (PIRs) declassification is in fact subverting the declassification process intent to no avail or useful purpose because it does not protect the sources and methods information. The latest arguments presented by the intelligence community since the summer of 2000 for not declassifying CORONA and KH-7, KH-9 follow on imagery and associated dates within the documents on the film based imagery (which has continued through 2003), is as more private satellite imaging systems are licensed, less data can be released. The U.S. Government has the rule to never interfere with commercial business development regardless of the fact that the tax payers have already paid for this. This is because together, the old images and the new commercial images can reveal national security trends over time. The problem they are afraid of is that if we look back we will find out what they knew which will allow us to calculate what they knew and when versus what we did not know to define the limits of U.S. Intelligence at that time. Actually the commercial imagery has no affect on this. To repeat all of this in point of fact has been declassified when the CORONA imagery was declassified in 1995. This has been further back-up by the Russian historic declassifications since the late 1980's early 1990s. The protection of sources and methods of how we knew about something, what we knew, and when and where on various facilities may be very sensitive to the community but they have already declassified it with the CORONA1-4B, KH-7/Gambit and some of the KH-9/Hexagon film release so why try and turn back the declassification clock. A colleague of mine Mr. Tim Brown made this clear at the NRC conference in the summer of 2000 that any body can get this from CORONA imagery as has been done. They were told this was being done in spite of what they may or may not release. Certainly in the manned lunar program of the Soviets this is a case in point. They figure at the rate of the new imagery being released that it will take 10 15 years before we learn all of this. This is pure balderdash as we have been doing it since the summer of 1996. The orbital Two Line Elements analysis data sets can be provided upon request by e-mail from the author at cpvick@globalsecurity.org.